Jorge Francisco Isidoro Luis Borges Acevedo, known as Jorge Luis Borges, was an Argentine writer, essayist, poet and translator born in Buenos Aires. In 1914 his family moved to Switzerland where he attended school, receiving his baccalaur�at from the Coll�ge de Gen�ve in 1918. The family travelled widely in Europe, including stays in Spain. 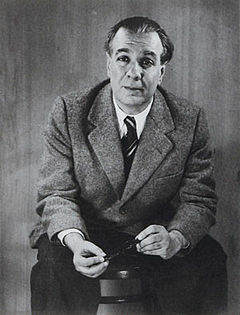 On his return to Argentina in 1921, Borges began publishing his poems and essays in surrealist literary journals. He also worked as a librarian and public lecturer. In 1955 he was appointed director of the National Public Library (Biblioteca Nacional) and professor of Literature at the University of Buenos Aires. In 1961 he came to international attention when he received the first ever Prix International, sharing the award with Samuel Beckett. In 1971 he won the Jerusalem Prize. His work was translated and published widely in the United States and in Europe. Borges himself was fluent in several languages. Borges had dedicated his final work, Los Conjurados (The Conspirators), to the city of Geneva, Switzerland, and it was there, in 1986, that he chose to die. His work embraces the "character of unreality in all literature." His most famous books, Ficciones (1944) and The Aleph (1949), are compilations of short stories interconnected by common themes such as dreams, labyrinths, libraries, animals, fictional writers, religion and God. His works have contributed to the genre of science fiction as well as the genre of magic realism, a genre that reacted against the realism/naturalism of the nineteenth century. In fact, critic Angel Flores, the first to use the term, set the beginning of this movement with Borges's Historia universal de la infamia (A Universal History of Infamy) (1935). Scholars also have suggested that Borges's progressive blindness helped him to create innovative literary symbols through imagination. His late poems dialogue with such cultural figures as Spinoza, Cam�es, and Virgil. His international fame was consolidated in the 1960s, aided by the "Latin American Boom" and the success of Gabriel Garc�a M�rquez's Cien A�os de Soledad (One Hundred Years of Solitude). Writer and essayist J. M. Coetzee said of him: "He, more than anyone, renovated the language of fiction and thus opened the way to a remarkable generation of Spanish American novelists."